The recent sudden drop in temperatures ( in DFW) is giving me a hint that it's almost the end of fall season and winter is right around the corner. I always prefer bright sunny days over gloomy winter days. I hate winter for several reasons.. cold weather, gloomy days, applying several layers of clothes are some of them esp in USA. But, I can't avoid this problem except obeying to Mother Nature. So i turn my gloomy winter depressed moments into bright by cooking warm and comforting dishes. It's even better when you make such dishes healthy & hearty it will be comforting from the cold weather with out damaging your diet but satiating your tummy! Win-Win, right! Today I am featuring one of such recipes Baked Acorn Squash Rings. 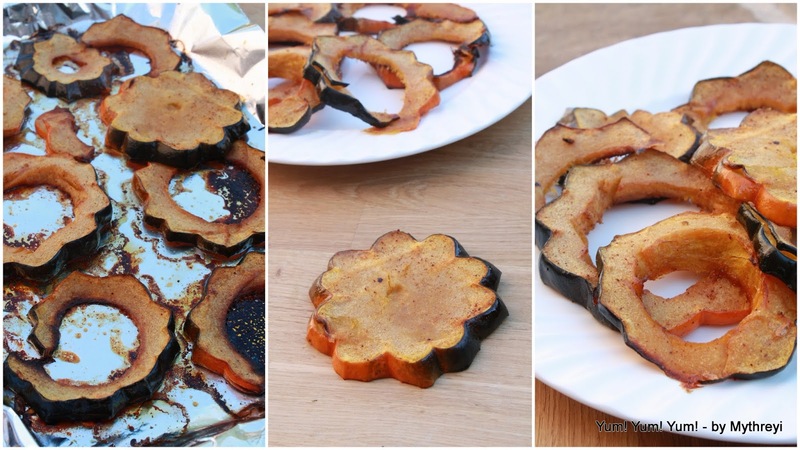 This recipe is like a Acorn Squash make over in 30 minutes as the rock hard squash turns into beautiful soft flower shaped rings with crispy edges. 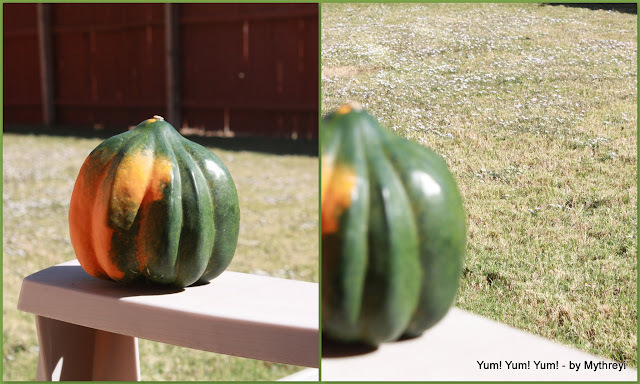 It's true that I got bored with Acorn Squash Masala and wanted to try some new recipe with this cute shaped Squash. I come across this recipe in my search as this sounded easy, effort less and made with basic ingredients. As I don't have brown sugar handy so i replaced it with Honey and loved the caramelized effect that it got with honey. To suit our Indian taste buds I have added couple more masalas to the seasoning mixture. If that makes it spicy for you, avoid it with no doubt. When I was serving this to VJ, I was crossing my fingers whether he likes it or not (usually he is picky about some vegetables), he loved it. I even packed these cute rings in the lunch box next day. Here is the recipe, Njoy! Trim the Squash on both edges and cut the unpeeled squash into 1/2 inch round slices, place them on cutting board, and seed out the center making a hole in the middle. Melt the butter and mix in honey. First season the Squash rings with salt, pepper and spices mixture. Place the Acorn squash rings on the baking sheet and apply half of the honey &butter mixture evenly with a brush. Bake them for 15 minutes. Turn the rings over and again apply the remaining honey & butter mixture on the other sides and bake for another 15 minutes. Once the baking is done, turn the oven to Broil mode in Low setting for 5 minutes. 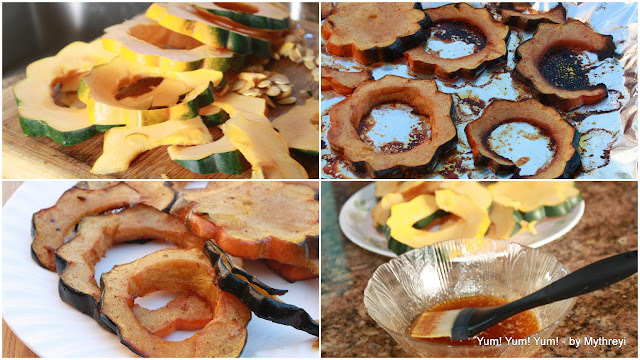 This turns the squash edges slightly darken brown making them more crispy and alluring. Loved this flower shaped ring, cute isn't it? The hard part in this recipe is slicing the squash into rings. Use any wide and sharp knife for easy cutting. First cut the squash in the middle horizontally, trim the edges and then cut carefully into rings. This can be served as side dish for your pastas, or on the side of meat along with some creamy mashed potatoes. I have packed this in the lunch box as a side dish along with some masala flavored rice. Will be back with one more fall recipe..
Beautiful rings, wonderful idea of baking acorn squash. Squash rings look so tempting.